Turns out I am an emo after all, sartorially at least. Actually fixing an actual toilet with my bare hands. Getting a promotion and a pay rise. Wallpapering a bendy wall with a very geometric pattern. Designing the artwork for lanyards, CD covers and other assorted bits for the world's best Tipi camping weekend. Training for a 5km run. Preparing my slightly shabby house for viewings from potential purchasers. Working events for a total of 3500 people. Me: My workload is too high and, moreover, unsustainable. I am worried that something important will be missed if I keep working at this pace. The levels of stress I am enduring, not to mention my working hours, are affecting my personal life. Boss: Why don't you come in early tomorrow and do it all then? Perhaps with a nice stop off at Dahab on the way back for a spot of sea life. Not bad for a 19 day trip. It also appears to follow a very similar route to the trip that my mum took when she was in her 20s. One of my fondest memories of childhood is her showing me photos and telling me stories about a red rose city - half as old as time. Nowadays, however, she seems convinced that anywhere outside of northern Europe is awash with roadside bombs, so it might take some convincing to get her on side for this one. Oh, how I wish I'd written that. Fortunately Neil Gaiman did it instead and I can't begrudge the man anything. Oh, and this is not apropos of nothing - David Tennant is due to play Oedipus Dane at the RSC over the summer. ...once, for about two days - between finishing drama school and getting a job. I even had an audition for one of the most famous theatre companies in the country (nay, the world). I wonder how many of my friends know this about me? I don't tell anyone at work and when people ask me what I did for a degree I usually evade the question but there is a bit part of me that misses telling people that I am an actress. Not being an actress, you will note, but telling people that I am/was/will be. There are things I miss about acting itself, notably the acting - the feeling of taking a piece of text and making it alive, making it real for me and for an audience, feeling an audience respond. But the associations with acting are not something I miss. Looking back I was always bored watching plays (how telling that I love feeling people listen to me speak but find listening to others totally un-engaging) and, as an actor, you're expected to spend as much time as possible watching other people's plays. And actors. In my year of thirty on my drama course I think I found five people who I didn't find supremely irritating. This is not to say that all actors are idiots, quite possibly it is only drama students I find so nauseous, and even more possibly it is because they, like me, are quite boisterous and I don't like them stealing my thunder, but nauseating they are. The "Luvvies" column in Private Eye is testament to that. Anyway, yes...I miss being a "going to be" actress. At school I was what people in the US call a "drama geek" and by all accounts a pretty good one. It was pretty much universally assumed that I'd be a actress, and probably a famous one at that. Or at least I think that was assumed - it's certainly what people said to my face but then I was a bit of a pain in the arse in those days (obviously, I'm perfect now) and I doubt I would have stood for any less. And there was certainly something pretty comforting about having such a clear and unquestioned predestination, even if it was one that didn't have any grounding in reality. I'm glad I'm not an actress, even if the dedication in my youth has left me with middle management, it's also left me with challenges I relish and a life that, by and large, fulfills me. That being said, when one of my oldest friends berates me for giving up acting, even though I argue the toss with him, inside I enjoy the fleeting feeling of destiny. Unsurprisingly US-centred list this one. And, sadly, no mention of my favourite (thank you, Roy) - the A4212 through Snowdonia - go see - Google Maps. 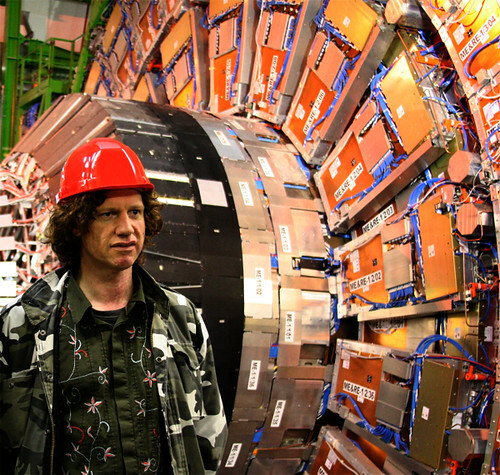 CERN clearly has impeccable comedic taste - inviting Chris Morris (Chris Morris!!) to speak about the Higgs Boson. Cereally, this couldn't in any way be cooler. It's also worth baring in mind that I have never (I mean never) had a relationship with any man who doesn't work in some kind of IT capacity.